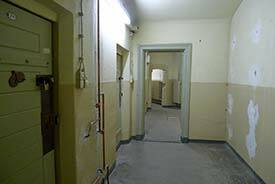 ABOVE: A hallway in a "Linden Hotel" cell block. INSET BELOW: The building's façade on Lindenstrasse, and a house number near the entrance. From the outside, Lindenstrasse 54/55 looks much like any other 18th Century building in Potsdam's historic center--until you notice the bars on the windows. The bars were designed to keep people in, not out, until the Soviet and GDR political prison--nicknamed the "Linden Hotel" by sardonic locals--was transformed into a memorial and museum after East Germany's "Peaceful Revolution" in 1989-1990. "The palace was built in 1737 and, in 1809, became the meeting place for the first freely-elected city Parliament. From 1820 onwards, the city courts used the building as a venue for trials and as a prison. In 1910, a large cell wing with almost 100 cells was constructed. "During the National Socialist dictatorship (1933-1945), politcal detainees were incarcerated here. There was also a Sterilization Court for persons sentenced, among other things, to compulsory sterilization under Nazi race leiglation. Resistence fighters were sentenced to death at Lindenstrasse 54/55 by the Potsdam People's Court. "Between 1945 and 1952, Soviet Intelligence used the building as a prison. Having been sentenced to long-term prison sentences or even death by a military tribunal, the political prisoners were accommodated in inhuman conditions. Between 1952 and 1989, political detainees were incarcerated in this building by the German Democratic Republic's State Security Service (Stasi)." Today, the building is maintained in its original condition by the Potsdam Museum as the Lindenstrasse 54/55 Memorial Site, with help from an organization--the Fördergemeinschaft Lindenstrasse 54, or Lindenstrasse 54 Support Association--that "provides a forum for people who have suffered political persecution and illuminates the shadows of the past." The Memorial Site is open to the public from 10 a.m. to 6 p.m. Tuesday through Saturday. The admission fee is nominal. For a slightly higher fee, you can take a guided tour. An audioguide in English may be available by the time you read this. For more information, see the German-language Stiftung Gedankstätte Lindenstrasse Web site, which has opening hours, ticket prices, and a map. For captioned photos of the Lindentrasse 54/55 Memorial Site, go to page 2 of this article.